At a Kraang facility, the Turtles are trying to figure out what weird purple chemical concoction the aliens are so diligently protecting. In the heat of battle, Raph busts the stasis tube, spraying himself and all his brothers with the chemical. By all visual evidence, it had no effect on them, so after trashing the Kraang and collecting a sample they decide to go home. Mikey is especially in a hurry to go home, as Splinter is on a meditation retreat and he wants to throw a party. Leo, of course, says it’s out of the question. Down in the lair, the Turtles are sitting on the couch and stewing. Mikey is mad that Leo won’t let him have a party or do anything fun, ever. Leo is mad because Mikey invited April anyway and undermined his authority. Raph is mad because Leo never wants to get proactive and take the fight to the Shredder. Don is mad because all his brothers ever do is fight and destroy all his inventions. A little while later, April arrives with party provisions and finds all the Turtles wrecking the living room, fighting with each other. They each storm off to their own room, leaving April confused. She goes to Leo who claims that Raph and his brothers are coordinating a coup to oust him as leader. Suddenly, Raph barges in with his own suspicions. He accuses Leo of working covertly for the Shredder and the two get into a fight. April is then pulled aside by Mikey, who is wearing a tinfoil hat. Mikey says that the tinfoil hat is the only thing protecting him from Zorblixion alien parasitic mind lasers, which are the cause of his brothers’ behavior. He then notices April isn’t wearing a tinfoil hat and accuses her of being one of “them”. April tries her luck with Donatello next, but Donnie is on to her. He says that she and his brothers are all just “actors” in costumes and that everything in his whole life is just a monitored setup. Don then attacks Mikey and the two tumble into the living room where Leo and Raph are also fighting. 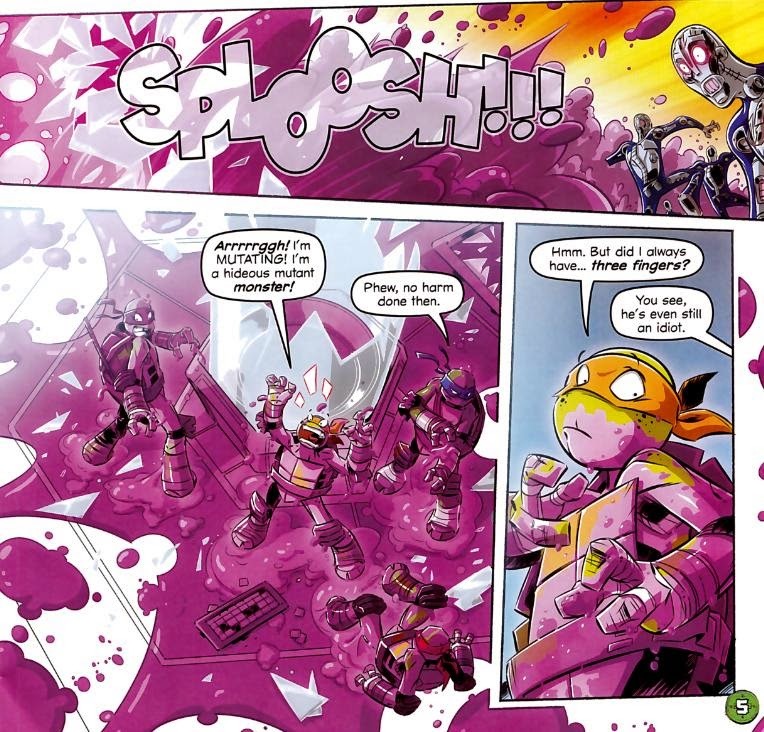 Naturally, April hasn’t a clue how to handle this situation, but luckily Donatello was already working on analyzing an antidote to the Kraang chemical before he went bonkers. Following his computer’s instructions, April synthesizes a cure and pours it into a Super Soaker. Zooming around the living room in a tiny go-kart, she sprays the Turtles with the cure and a few minutes later they come to their senses. The Turtles thank her for saving the day… just as Splinter comes home. Leo insists that the mess isn’t the result of a party and Splinter merely turns right back around and goes on a second meditation retreat. Mikey is thrilled, though, as Splinter’s absence means they can now have a REAL party. 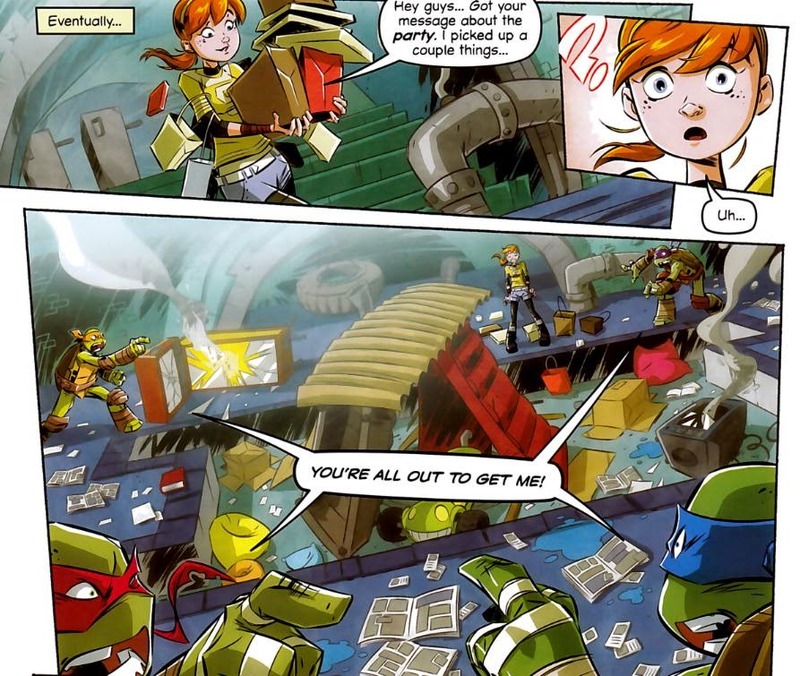 *This story is continued from TMNT Magazine (Panini) #13. The story continues in TMNT Magazine (Panini) #15. “Paranoia” was a great script and I’m glad it received the double-length treatment in Panini’s TMNT magazine, as it gave Walker more room to wring the most out of the situations. Each of the Turtles’ conspiracy theories reflects their personalities or positions on the team and it’s a lot of fun. 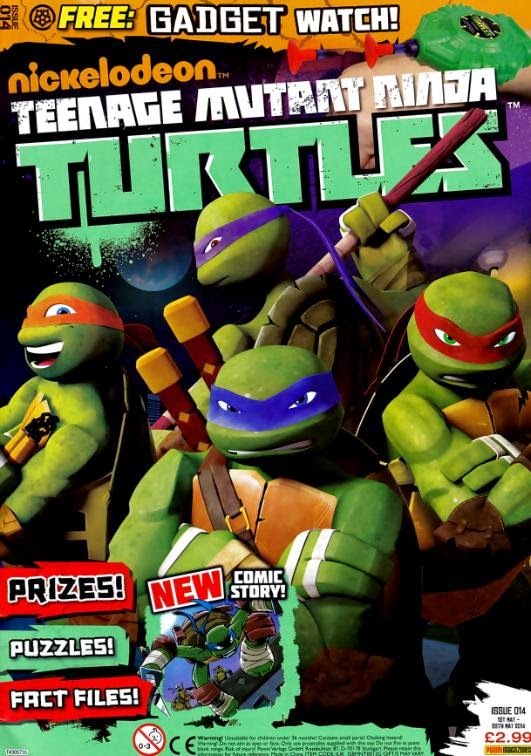 Leo is afraid someone wants to steal his job as leader, Raph suspects his brothers are working for the Foot, Mikey’s wild imagination gets the better of him and Donatello constructs an elaborate “Truman Show” style scenario that sort of speaks to his ego. It’s the hallmark of a good story when you wish the comic had been longer. There is one issue with “Paranoia” and it has to do with its similarities to the season one episode of the Nickelodeon TMNT cartoon, “Parasitica”. 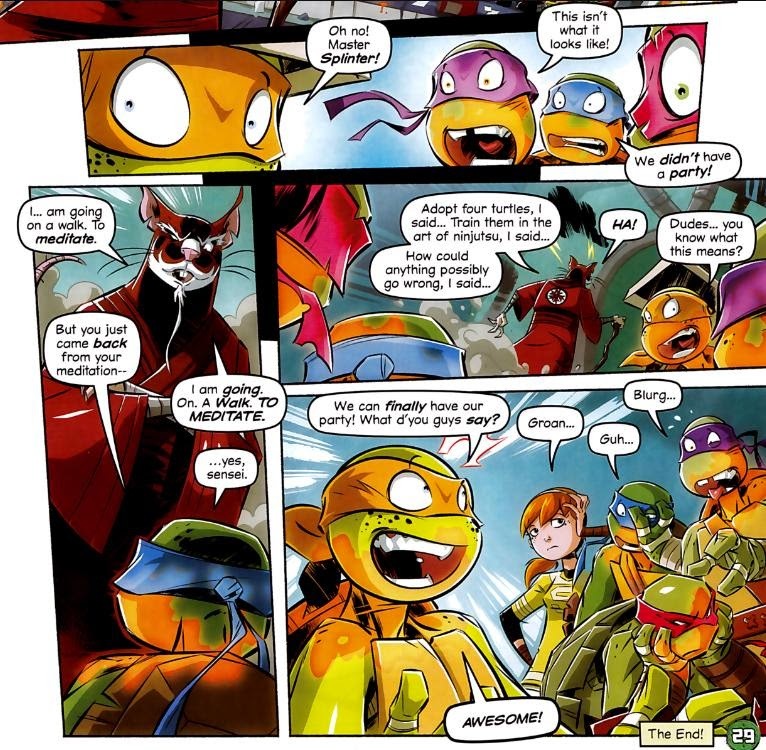 In that story, all the Turtles save Mikey get infected by mutant parasites and go crazy. Donatello begins synthesizing a cure before the parasites get to him, leaving Mikey to finish his work. The setup is very similar to what April goes through and how she ultimately resolves the conflict, however, the tone of “Parasitica” was very much horror while “Paranoia” was definitely played for laughs. A tongue-in-cheek callback to that episode might have helped, though I think the similarities in titles might have actually been said callback. More great line work from Cosmo White, too, with the usual glowing colors from Cardy and helpers. Now that IDW and Panini have begun sharing their talent (in lieu of sharing their actual content), I’d definitely like to see White pop up on the TMNT New Animated Adventures book. I’m not sure how his pencils would look in conjunction with Heather Breckel’s style of coloring (which is very different from Jason Cardy’s), but I’d sure like to see it. The only thing holding “Paranoia” back is that it’s a little derivative. But if you can look past its similarities with “Parasitica”, it’s actually a lot more fun.